Wake up, go to work, come home, eat dinner, go to bed, repeat. Our days seem so full that we tend to repeat this cycle over and over again throughout our weeks, months, and even sometimes years of our lives. When we engage in such a consistent work-week routine, it can tend to feel like our lives have become “automatic,” “monotonous,” and “exhausting.” When this occurs, we tend to work less efficiently and rejuvenate less frequently, leaving us feeling unfulfilled and empty. The question to ask yourself is: How do you get yourself out of this mindless routine and bring more rejuvenation into your life when you feel you don’t have time? You may feel like it is impossible, but below are a few ways you can begin to be more intentional with your days and live a mindful, more balanced life. Start small by incorporating one or two of these strategies into your weeks, as incorporating all of them at once may feel overwhelming. It can feel good to have structure and routine in your life. Over time, if there is no flexibility in your routine it can feel mindless and you may begin to feel like all you do is work, eat, and sleep. It takes little effort to switch things up in your daily life to make it less monotonous. For example, you can take a different route to work, get off the train one stop early and walk a little farther, go to a new grocery store, or talk to someone new at the office. Intentionally mixing things up means you aren’t just going through the motions and you can feel stimulated each day. This is an easy way to break the routine you do day after day. After a workday it can feel like a big task to engage in self-care and unplug. Waking up an hour or two earlier than you currently do can help you dedicate time for yourself before your day has even started. Use this time to leave your phone in another room, engage in meditation, exercise, relaxation, or journaling. The things you engage in during this time should be things important to you or things that make you feel good. Dedicating some time to yourself in the morning helps you get a healthy start to your day and feel more accomplished and energized. 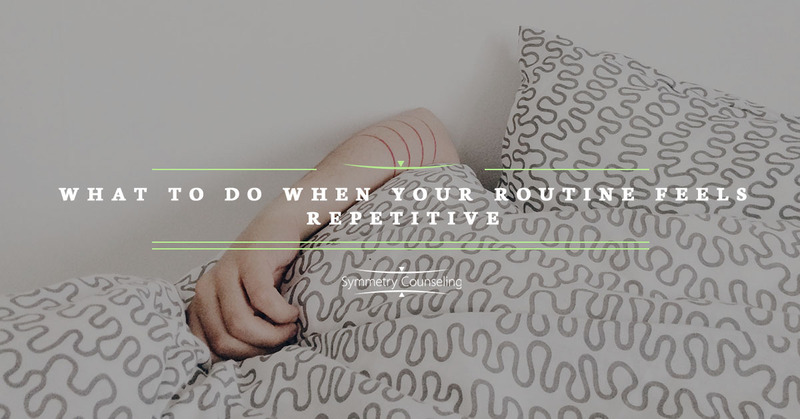 Adding things to your routine can feel like a chore. When it comes to self-care and recovery, it isn’t about how much you add, but rather the quality of it. In order to excel and achieve at things in your life, you must optimize your recovery time. In your off-time, it is important to socialize, nurture relationships, take care of yourself, and do things that fill you up with positivity. To make the most of it, practice being in the moment and being mindful as you engage in these forms of self-care. Focus on what you are feeling, the conversations you are having, what you see, and who you are with. If you are finding it difficult to be intentional with your time and would like some support, it may be useful to connect with a therapist. Contact Symmetry Counseling at 312-578-9990 to set up an appointment with one of our very skilled therapists today!